Woke up this morning to a white deck! I’m happy….that’s enough snow for the year. Fortunately, I think we have had the snow for the next several days. It will be really cold again tomorrow, but we will see a warming trend and actually be in the upper 40s by Monday and upper 50s Tuesday!! Then 50s through the entire week and into the weekend. Right now they are forecasting rain over the weekend but that it an entire week away. We’re wait and see. Yeah!….warmer weather. Past few days we have seen three to four hours of generation in the morning. Off around 10:00 a.m. for seven to eight hours then back on again for several hours. Probably will continue with this schedule unless we get some major power demands. They have followed that schedule so far today. New Years Day was cold!! Yes, it was in the 40s, but with no sun and lots of wind, it was downright cold. A few of the gals from the club were on the river Sunday and fishing was pretty slow. We caught a few fish and kept our tradition going. There is one less think on Jamie’s bucket list….fly fishing. She has been wanting to learn how to fly fish and New Years day was the day. She took a half day instructional trip with Carolyn and definitely learned the basics of casting. 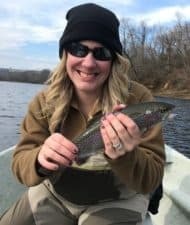 She got the natural drift down and caught her first trout on a fly rod using a ruby 2 midge ! Even though the day was raw, I hope she keeps it up. Said she really liked it. 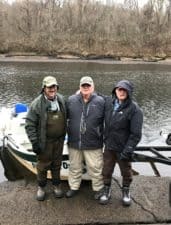 Monday, the three musketeers, Doc and Terry, from Oklahoma, spent most of the day on the water with Stan. Unfortunately, it was even slower fishing than Sunday. They did catch a few fish, froze to death but had a great time. This entry was posted on Thursday, January 5th, 2017 at 4:51 pm	and is filed under Fishing Reports. You can follow any responses to this entry through the RSS 2.0 feed. You can leave a response, or trackback from your own site.